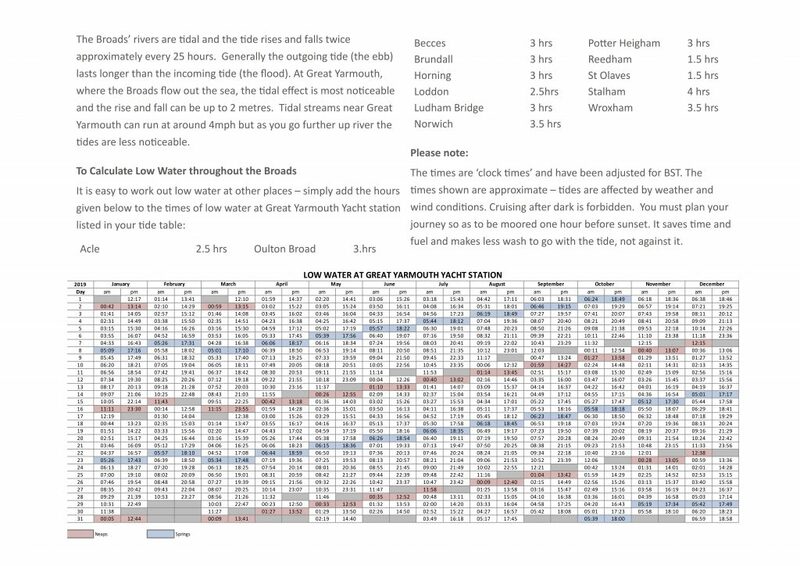 Our 2019 Tide Timetable shows the low water times at Great Yarmouth Yacht Station and how to calculate low water at other locations around the Broads. The Tide Timetable above gives the low water times at Great Yarmouth Yacht Station throughout the year. It is easy to work out low water at other places around the Broads, simply add the hours given below to the times of low water at Great Yarmouth Yacht station. All times are ‘clock times’ and have been adjusted for BST. The times shown are approximate and tides maybe affected by weather and wind conditions. Cruising after dark is forbidden, make sure you plan your journey so that you are moored one hour before sunset. For more information about Tide Times and how they are calculated see understanding the tides.